I was just passing in another bus past Jingmei Station and a stopped bus was surrounded by police and ambulances. When we passed, there was quite a lot of blood on the street under the tire. It was just past the crosswalk, so this may be another case of a bus hitting a pedestrian. It was the 278 bus, which makes a left turn onto Roosevelt. I’m not sure, but I think this is the type of crossing where left turning traffic has to wait for a gap in pedestrian traffic to continue. It’s also possible that the woman was a scooter driver. The front of the bus seemed to have damage but I didn’t see blood. This bit of news was already posted with pictures. As a warning, even pixelated it’s graphic. I don’t know how to turn off the preview and I don’t want to ruin anyone’s day so I’ll put it further down. If someone finds more about this please update. There are no other details yet. I often take that bus and MRT station. It’s dangerous because at both exits, the buses stop on the opposite side of the street from the MRT entrance. At one bus stop there is always such a scrum of buses, garbage-laden go-carts, etc. that people getting off the bus may find themselves very far from the crosswalk (which is near-useless in Taiwan anyway), and so reach the MRT entrance by darting between stopped buses, maneuvering around the wall of parked scooters that always blocks the other side of the street. etc. I’m not the least bit surprised that somebody got hit here. The other entrance is across the street from the entrance to a local market, and the bus stop is on that side. It’s not as dangerous as the other, but you still have to cross a busy street without any sort of stoplight. The sidewalk on that side is crammed with street stalls, beggars, and of course parked scooters, so you may not find an opening to get off the street. I have often wondered why they did not simply reverse the direction of the buses so that the bus stop is on the same side of the street as the MRT at each entrance. At one bus stop there is always such a scrum of buses, garbage-laden go-carts, etc. Is that the one close by the police station? I was there a long time ago and you had to walk on the street to get to the bus stop. I thought it was due to construction, I was coming from the Jingmei market today and went back there to get the bus and it was exactly the same, scooters and trash carts everywhere with pedestrians a meter from moving traffic. That’s not where the accident happened. I’ve been through that crossing several times by bike. I never thought it was any more dangerous than any other large crossing here. That whole area is laid out oddly though. When I was searching for news about the accident, I saw an article from the same source about all the scooters parked around the market. brutal shots. hard to see what happened from the pics, obviously its some kind of ‘accident’ nobody is fault. taiwan is very convenient! Take your time, walk in a predictable manner and DO NOT dart out of anything to catch some train or whatever. Avoid using crosswalks if you can. Those underground or overhead walkways are there for very good reasons. Don’t expect Taiwanese bus drivers to look where they are going, they do have blindspots and they don’t often check. I guess they must have a very tight schedules because sometimes they drive like GTA 5. Is that the one close by the police station? The police station (Wenshan 2nd) on the same street but further up. 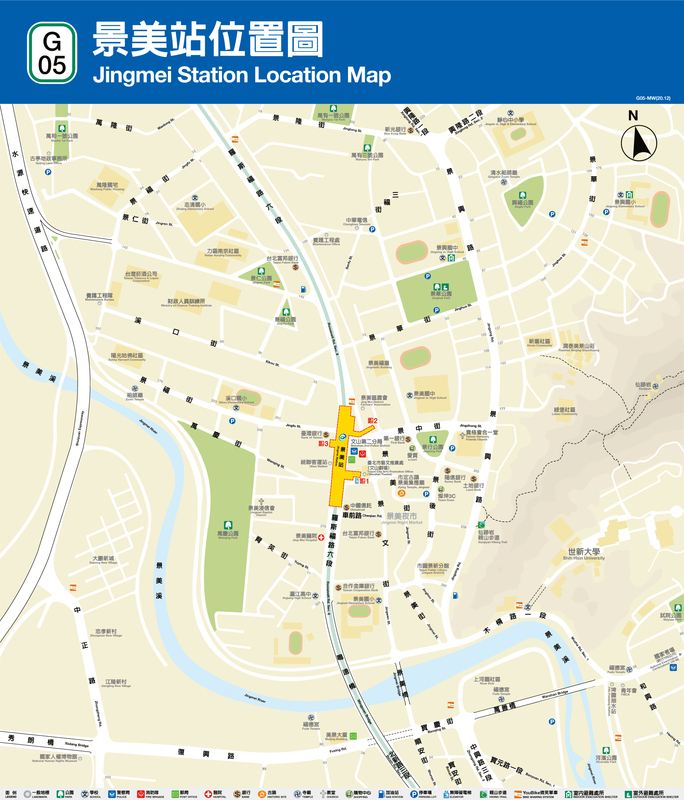 Here’s a map; the really dangerous one I mentioned is at MRT Exit 1 (getting off northbound buses on Jingwen St.), and the other one I mentioned is Exit 2 (crossing Jingzhong St.). Let me guess. Bus driver wasn’t checking his mirrors and driving in a hurry. Shocking. It should be news when buses don’t go through red lights and they start driving cautiously. I blame their bosses that push them to drive this way. 2 New Taipei buses spotted actually stopping at zebra crossing before barreling down the road.Taiwanese citizens shocked when they spot two New Taipei City buses actually stopping at a zebra crossing before proceeding forward. I suspected that video was deliberately posted for good PR. I didn’t think that sort of behavior would last, and it hasn’t. This article adds a bit of information and pictures of people taking pictures. The woman was crossing the road, but it doesn’t specify by foot or vehicle. I only had eyes on the scene for maybe 20 seconds, but I looked for and didn’t see any signs of a scooter or broken bits on the street. The front of the bus was damaged, though. Given the post time of the first article and when I passed by the first time, I think the accident happened between 1pm and 2pm. I passed the second time at 2:30. I don’t know how long it takes to clean that sort of thing up. Edit: New update. The woman was 84. Sounds like walking. The driver wasn’t paying attention, blamed fatigue and blind spot, police say not drunk. Doctors say the woman’s leg will be amputated and may or may not survive. “Exact cause” still unknown. One thing I know, that bus hadn’t left it’s terminal 10 minutes before. That crossing is between it’s second and third stop, and the first stop is a minute away from the terminal. I don’t know how long they have between one route and another, but if he was too tired to see straight he should have tagged out. And it was around 1-2pm. He couldn’t have been going for more than 7-8 hours if he had the early shift. If he had the late shift the night before, the bus company is at fault. standard taiwan driving procedure is the cause. my guess is the woman didn’t run out of the way quickly enough as the bus driver was expecting her to. I see the Brown 9 bus do this regularly, at ChengGong/JinHu Rd intersection in Neihu. Pedestrians “should” wait for the pedestrian-only light there, but I’m guessing it’s been an issue in the past, and so the Br9 ALWAYS stops dramatically to check the crosswalk before proceeding. It’s really obvious, because there generally isn’t anyone crossing when cars are driving through.